﻿ A new card system for the Russian L3-3 tube tester. When I opened the lid of my first L3-3, I thought Oh no! What crazy machine is this?! Later I realized, it is the best tester you can buy for the money. Though the original cards are in Russian, which is extremely difficult, when you are like most people, not a Russian. They use partially the same letters as we, but add to this several letters of their own, and to make it nicer, exchange some letters, like replace S with C. In the end, only 20 or so of those cards have some limited a use today, and even this is hard, because of the language confusion. Add to this, the handbook is only in Russian, but I do have a text version (so not scannned pdf) and this translates in Google nicer every year. So for that is a solution in sight. One of the greatest testers ever made, at very reasonable prices and fine condition. They run on any voltage and frequency, but.... no cards, and there no manual how to make them. Now for the positive things. This this tester can do almost any tube there is! After spending days, making a few new cards, and still unsure if it they have mistakes, I decided to write software for this. What is needed is the basic set up of a specific tube type, this can only be done (safely) by taking a similar, 100% proven good card, then enter the data sheet information in the software, and voila: A new card. As far as I know, these cards run also on the earlier versions Kaliber testers, so not just L3-3. Please verify yourself if a lower type works on L3-3 cards. Click here for general information about how to test amplifier tubes with this tester. At first I made these cards only for myself, but some friends wanted them also, so I have put them up for sale. I need to maintain a color laser printer just for this only. If I would use the office printer, then after each windows update the card dimensions might be changed, and the cards would not fit the holes nicely. Microsoft produced a few jokes like this and of other kind already. So all in all it is a lot of work making a set of cards, and it hardly covers the cost. They are plastified, and I have to hand punch the holes with a tool. Also making them is NOT easy. There is no manual or guidance of any kind, and the options to make mistakes are many. So I am always grateful for good suggestions. Good ideas for improvement have also come from other users. When you are satisfied with the cards, I would much recommend you the three-scale meter face plate, so reading can be done without calculator. Also the "quick settings" which is using the '15' scale, works better then, because now you need to use the '150' scale for that, as this is the only scale a standard meter has. Like that, for a set of personal cards, and a new meter face plate, you spend perhaps 100 Euro all together, but this brings your L3-3 at a fully other level. For instance I have a customer with a HiFi shop, and all he does, is testing KT88 some ECC-types and 5U4G. For him the small investment payed off after one amplifier repair. Cards to check the tester itself. Instruction cards. Just good reminders, having the same dimensions as other cards. Auto Bias test cards. To decide if tubes are good or bad. Emission Test cards. To estimate remaining lifetime. Adjustable Bias test cards. For tube analysis. Circuit Design cards. These set up a working auto bias circuit, with an external bias resistor, which you connect with two banana cables in socket #9. This card has all (appr 130 ) holes punched. This is a lot of work, so please understand it costs more than other cards. For the function and the use of the universal card: Read all text here. Empty space for new to be made card. Heater to cathode Leakage. This kind of leakage is very useful to test, with tubes, that can be source for hum. That is usually all pre-amp tubes, but also tubes like KT88 or EL34 if used with AC heating in the music amplifier. It is only a card, with pictures ''how to do this ''. It has the same dimensions as the other cards. The L3-3 handbook explains this measurement too complicated. So this card is handy every time you want to do such a measurement. Read all text here. Grid1 Leakage may develop when tubes get older, or at high temperature. It can be caused by gas, by grid emission, contamination inside the bulb, or dirt inside the socket. .Also grid leakage appears like a form of damage when tubes were over heated. Grid leakage change the bias of the tubes, causing damage at tube or amplifier. Even so, when leakage is caused by gas, the tubes can spark unexpected. The L3-3 handbook explains this measurement too complicated. So this card is handy every time you want to do such a measurement. Read all text here. Card # 5+6. Transformer tests. This order number is for two cards. With those you can test most windings of the mains transformer, and in addition verify if the internal mains calibration of the tester is correct. This test is much recommended for any unknown tester, like when you just bought it. Some people damage the mains transformer, or burn the cable tree, and the tester still works, but with limited precision. Typically such a tester gets sold on Ebay, as feedback on Ebay is for initial satisfaction only. I once was fooled with such a tester myself, so it can happen. Read all text here. Part 2) New meter face plate. A three scale meter face plate is one of the most recommended things. 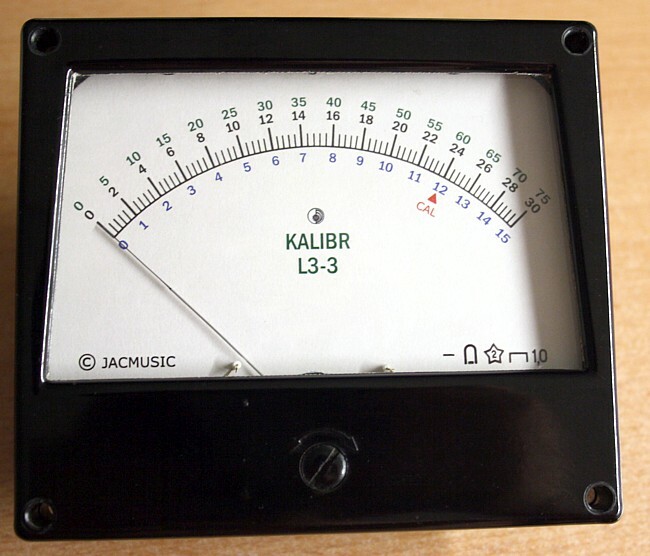 The Russians used a standard industry meter for the L3-3, which is a pity, as in fact the tester uses three different scales. So one 30, 75 and 150 scale. You can send in the face plate of the meter, or the whole meter. The original printed divisions will not be removed. Only the numbers will be rubbed off, and a transparent foil will be attached to the face plate, with three scales in color, and a red marking at ''63 '' which is very handy to adjust any 6.3V heaters. You can't see the difference with an original color printed face plate. Also the ''quick setting '' of the cards below is easier, as this always refers to the scale ''0...15 ''. Whereas the original meter scale doesn't have that scale. This may be needed, but you need to send in the meter glass and white plastic insert if there is one. To test if the antistatic layer is still good, set your tester with some card, such that you can change the heater voltage with DC. So this way, you can set the needle in any position. With some various positions of the needle, rub the glass with a dry cloth. If that changes the reading of your meter, the original antistatic layer is gone. This is a transparent conducting layer, applied from the inside with a fluid. So somebody has cleaned the meter glass from the inside, this layer is gone. After treatment renewal, do NOT clean the meter glass or white plastic insert, or the layer will wipe off! Meter Repair: Though the L3-3 meters are generally in very good condition, you can send them in for repair if damaged. Take care when you replace the meter of your tester. These are standard 150uA Russian meters, but you need a type with 0.5% maximum error, and the same impedance as the one you have, and there are different impedances used in the L3-3. So just any 150uA meter is not enough. Each tester has a factory calibration for the individual meter that is used. So when you replace the meter, you need to re calibrate the tester for the new meter. This alone tells something about the precision of an L3-3. These cards show how powerfull the programming of the L3-3 tester is. Simulate a real amplifier circuit with the L3-3, and test this tube in auto bias. Use variable plate voltage, and measure plate current and plate voltage directly with the L3-3. Uses internal decoupling capacitor of the L3-3, and your own bias resistor can be connected to socket #9 with normal banana plugs. One banana cable comes in one of the two wide holes, another cable comes in the ground plug. To the other end of the cables you connect the bias resistor. I use a resistor bank for that, but you can also use a fixed resistor. Or, you build a 100mA variable resistor into a box, and connect this with banana cables directly to the tester. All other electronics is inside the tester. These cards are quite universal, because the critical thing is the heater voltage. The range for voltage is adjustable, and bias is auto bias anyway. Depending on your actual tester tolerance and on the actual mains voltage you need either the 2.5V transformer tap or the 3V transformer tap, in order to be able to adjust to exactly 2.5V. Buy both cards is a good advise, because mains voltage can always change. These are some ideas that I want to follow up. These cards turn the L3-3 into a lab power supply. Why pay a lot of money for high voltage supply? This card will turn the L3-3 into a stabilized dual power supply of 2x 300V / 150mA, with separately adjustable voltage, and current measurement for one power supply via the panel meter. Higher voltage is possible at lower current, but this is unspecified. Additional, an adjustable heater voltage is generated, which can be set via the panel meter. All connections via the Octal socket. So you need to make your own adapter box, which plugs into the octal socket. THE CARD YOU NEED IS NOT LISTED HERE? make an adapter socket, and then here virtually every tube is possible. Part 5) Test Cards for tubes. Click the link in the left, for details. Card to analyse a tube. It uses AC heating, and a method to fine-adjust the AC voltage. You can verify a tube against RCA 2A3 curves with this card. Auto Bias Lifetime Test / or burn in card at 60mA. Interesting tube. This seems to be a better 6SN7. Only with plate caps and 2V heater. This card tests the rectifier under full load, in a real rectifier circuit. Unlike most other testers, which test tubes at lower power, and try to say assume from there how the tube ''might '' work in a real circuit. There are no settings with this card. Just plug and read. Some rectifier tubes can output 250 Watt. Because of great heat, the tester may be used only 1...2 minutes like this, and must cool down 1...2 minutes before test another tube. If so, this is written on the card. Adjustable Bias This is a very high heater current tube, and the adjustable DC source of the L3-3 can't supply this. So the tube must be AC heated. However the closest AC heater voltage is 7Volts, and you need to offset the mains calibration until the 7V becomes 6.3V. The card tells you want value you need for that on the meter scale, it's an odd value, but the result is correct. However with my tester I can't get any lower than 6.5V. Which is ok because tolerance is 0.31V on the 6.3V. So you have to see how this works out with your tester, as it depends on your mains voltage too. For the rest the card is fine, I tested some 6080 with it, and they perform nicely up to the data sheet. This card is adjustable bias. Which makes sense for 6080, as the difficulty with this tube is plate current is very variable. So you can check the difference between two of the triodes in one bulb. This is a low hum pentode for HiFi purposes, but this tube can not be plugged in Pentode mode with this tester, due to unusual pin out of the tube. However it can be plugged in triode mode, and a detailed triode data sheet exists from Brimar, allowing normal testing of this tube. Attention, this card will show two Anode plugs, in green color, but you must always leave both plugs in. Mixed Bias. Bias resistor and adjustable grid voltage at the same time This is the original factory test method for this tube, it works with auto bias, but also gives a fixed voltage of -7Volts to the grid. Like this the tube will show some of it's natural variation, but at the same time the auto bias gives a certain level of protection. Also, you can adjust the grid voltage if needed, so to get 95mA, which is the only right current to test the Gm of this tube. Original factory limits are used here. Note: 6C19 has a Zirconium getter, which has no silver color on the glass. So don't be confused by the missing getter mirror. Adjustable Bias This allows you do do anything you want yourself, so it's for analysis the way you want it, and you need to give your own interpretation, or compare it with the data sheet Also this is better for matching. Whereas the Mixed bias is better to check tube quality. It is recommended to use both cards. So the mixed bias card tells you if the tubes are good. The adjustable bias card is more suited for matching. This tube shows a lot of variation in DC Bias. It is a bit unclear what test limits shout be, and original Russian data sheets say not much about it. Data used here is collected from hundreds new production and NOS tubes that we tested with this card. Adjustable Bias Dual Triodes option. 6SN7-REJUNIVATION Under some conditions, tubes with low emission can be improved. It seems 6SN7 is one of those tubes. Forward Voltage Card can be made. You can analyze tubes with this card. 250V. Adjustable Bias Read more about these part numbers. See also Card for VT25, it is slightly another card. 425V. Adjustable Bias Read more about these part numbers. This card needs a 425V DC Voltmeter. You have to attach it to the banana plugs in the deck. Adjustable Bias Emission Labs tube. Special information about this card. This card is the same as 274A card. These use the UX4 socket. This card is the same as ''Type 80 '' card. Adjustable Bias This is a 20V heater tube, but there is a way to set the heater voltage to 20V, and use an external voltmeter to set it. You will be surprised how many 717A tubes are sold in Ebay as so called ''NOS '', but these are heavily used, with loss of emission. Really do not buy 717A without test data! As these were inside equipment, the optics is usually fine, even when half worn out. Ebay sellers put those on a Hickok, and the tube is ''fine ''. I can tell you, when you have an L3-3, you will be able to separate the used from the real NOS much better as with an Hickok. Adjustable Bias Card can be made. In the Funke 19 card was an error. This was corrected in this L3-3 card. Dual Triodes option. This L3-3 Card simulates the famous FUNKE W19 test method. To my opinion the best emission test introduced by Max Funke. Interesting, this can be repeated with the L3-3, by extracting the test settings and test results from the original cards. This is much recommended when you have used tubes, and you want to know how much lifetime is in them still. 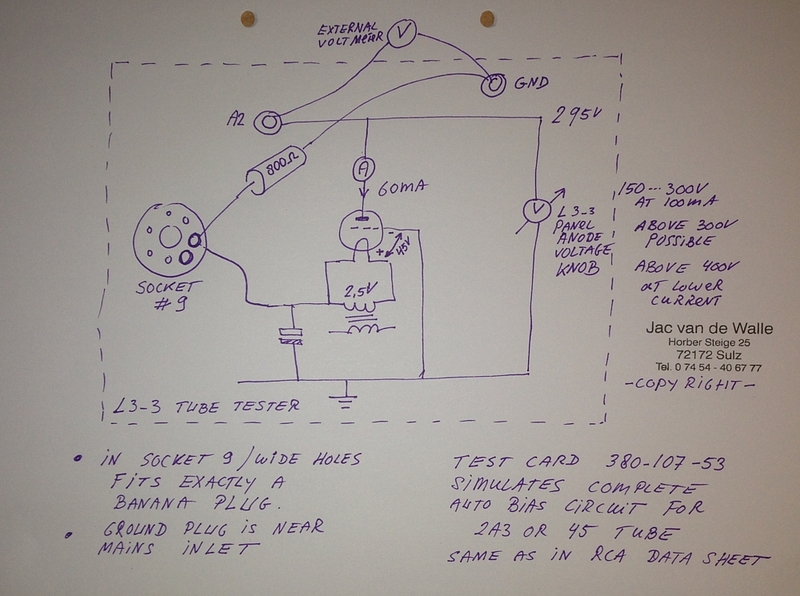 JJ has slightly different transconductance, compared to RCA data sheet This card is for the JJ tubes. For this tube you need to build your own adapter socket from UX4 to AU8, triode connected. Rectifier general instructions. For this tube, order the RGN1064 card, and make an adapter from RGN1064 socket to AZ1 socket. This is a 20V heater tube, but there is a way to adjust the heater voltage to 20V, and use an external voltmeter for adjustment. (Health Check) This card uses original Telefunken Data, which is available for very few tubes only. This is a health Check. It shows exactly at which reading the tube must be replaced. This card uses original Telefunken End-Of-Lifetime limits, which is available for very few tubes only. (Health Check) Dual Triodes option. Dual Triodes option. This card uses original Telefunken Data, which is available for very few tubes only. The ''Good '' value must reproduce exactly for a new tube. There are two limiting values on the card. These are ''good '' and ''bad ''. However you may see a tube is below ''good '' and above ''bad ''. This is called the ''? '' range. This means a tube may work in circuits that are less demanding. (W19-Quality Test) Dual Triodes option. This L3-3 Card simulates the famous FUNKE W19 test method. To my opinion the best emission test introduced by Max Funke. Interesting, this can be repeated with the L3-3, by extracting the test settings and test results from the original cards. This is much recommended when you have used tubes, and you want to know how much lifetime is in them still. ECC802S has tighter tolerance than ECC82, which is reflected by this test card. All bias methods Use one ECC82 card and one ECC83 for this tube. More information here. You need to make your own adapter socket, which you have to wire as EL34. Settings and test method is for original EL11, but the tester has no socket for this. You have to make your won adapter socket. Wiring scheme same as EL34. So taken an Octal base, and solder a P8 socket on it. wire it from EL11 to EL34. This card is pre-set for 17.5 Watt, which is the safe mode. Without any guarantee on this, it is expected you can plug in any EL34 and even such tubes that tend to draw more current that normal, will not be biased above 25 Watt. Yet you do need to check this always. Good card for series testing. Card for individual tube testing. Adjust the plate current always at max 100mA by hand, to prevent over heating the tube. The tube is tested in the manufacturer's recommended Auto Bias Circuit. The ''Good '' value must reproduce exactly for a new tube. There are two limiting values on the card. These are ''good '' and ''bad ''. However you may see a tube is below ''good '' and above ''bad ''. This is called the ''? '' range. This means a tube may work in circuits that are less demanding. .MAGIC Eye. Magic Eye. Card Can be made only when I have time for it! Just for my own interest too, this will cost me half a day. Adjustable Bias Gm values are different in all data sheets In Tetrode mode, at 250V, -15V, GEC has 7.3mA/V, Marconi 6.3, and JJ 6.0. Quite a mess. We take the GEC Values for the card. Moreover, GEC is the only company specifying a ''End of Life '' value.
. Read detailed instructions about KT88 matching here. (Health Check) KT88 testing begins with this card. If the tube fails, it's a reject. Like most Auto bias cards, this is a Health Check for the tubes. 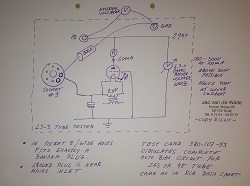 A real auto bias circuit with cathode capacitor is programmed inside the Tester. To make the test harder even, this is done at higher current than normal, and lower voltage than normal, so to get 40 Watt dissipation under harder than normal conditions. This is in accordance with the GEC data sheet If the tube passes here, it has a lot of emission. For matching you would need the Adjustable Bias KT88 card. I seems possible with this card, to unplug a KT88 without having to switch off the tester, but I can not guarantee this. So far, this worked fine with all four of my L3-3. Like this acceptance tests could be performed quickly, as there is no settings to be done at a tube change. JJ tests it's tubes at 100mA vs 140mA for the G.E.C. KT88. Doing so, transconductance comes out lower at 100mA of course, for any brand tube. The purpose of this card is to test JJ tubes vs JJ specifications. For the rest, you can test any KT88 with this card too, the normal way. Just some awareness should be created, JJ uses 100mA, and this by itself gives different ''good-bad '' acceptance levels, and it is just these special JJ limits are marked on this card, which includes also the color bands at the bottom of the card. Adjustable Bias Interesting when you have a KT88 Triode amplifier and you want to match or test the tubes specially for Triode mode. This gives more accurate results for Triode mode, because any effects of the screen grid is eliminated, and screen grid properties of KT88 is quite variable. For this reason you will see slightly higher Gm in Triode mode. Note, with this card, the Screen Voltage of the L3-3 is disconnected. 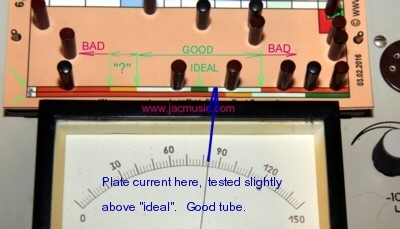 The Screen Grid of the tube itself is hard wired to the Anode, so it's a true Triode Mode test. TESLA Factory Transconductance acceptance level. I have a copy of the original TESLA Factory acceptance level tests, which I do not hand out (Sorry). I think it is by coincidence, but the programmable circuit of the L3-3 can exactly repeat this test. So it was logical to make a card for it. You can use this card to check a quantity of KT88 for Gm at incoming inspection. This card looks like the Auto Bias test card (above), just this is by the internal TESLA Factory tests. Probably a more harder test as the published (user) version. Cut off test. This is a good second card to take for KT88. I have a copy of the original TESLA Factory acceptance level tests, which I do not hand out (Sorry). From this, I have this cut off data for the KT88. You can use this card to check a quantity of KT88 for Gm at incoming inspection quickly. As any cut off data is hard to find, this test is a very good one to do. Also the L3-3 anode current meter could be set for 1.5mA. So the acceptance level is 2.5 divisions on the panel meter, which you can see indeed. This is a 4 Volt tube. The heater is adjusted to 4V AC, using an AC voltmeter. The meter itself is plugged into the wide pins of the two large holes of socket 17, using normal banana connectors (They fit in there exactly). Then, with the ''mains '' adjustment knob, you can set the heater to 4V, AC. This is not such an extremely elegant way to get 4V, but the current draw of PX25 is quite high, and so it works well. More info about how to do this is on the card. Adjustable Bias Read more about these part numbers. See also Card for ''10 '', it is another card. We offer this beautiful new made, lacquered box for 65 Euro. It has a metal, painted bottom and soft felt feet. 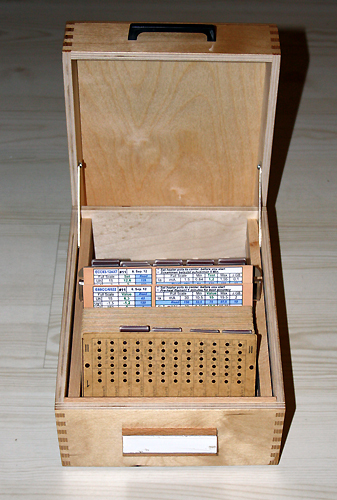 This includes a 25 pcs plastic tab set, and a metal space holder, which divides the box in two parts. The space holder, you can clip in the bottom at multiple positions, to adjust for the thickness of your original card set. Like this, the card set will flip comfortably. This also leaves an extra compartment inside for anode cables and small items. This box is exactly made for the dimensions of the original Russian L3-3 cards. There is enough space inside for the original Russian card set, plus a similar number of new made cards, plus a small space behind the cards, for the anode cables or small items. You will LOVE this box!